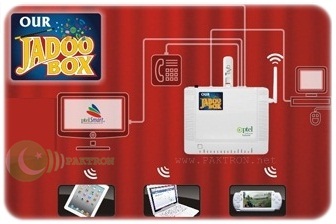 Pakistan Telecommunication Company Limited (PTCL) has brought to its customers a fascinating Jadoo Box – a device that gives uninterrupted connectivity on wired DSL as well as backup wireless. Introduced in three attractive packages, the exciting new "Jadoo Box" gives commercial and residential customers unlimited and uninterrupted Internet connectivity through a winning combination of DSL and EVO Nitro bundled together. Jadoo box is a device which provides uninterrupted connectivity by using wired DSL as a primary connection while a wireless connectivity as a backup. This device has been designed to provide connectivity for PSTN, Broadband and Wireless Broadband. PTCL intend to capitalize on the uninterrupted connectivity needs of our high ARPU customers by providing them this unique solution which will help establish PTCL as the converged solutions company for its users. Topping it all is unlimited voice connectivity that customers can enjoy through this magic device. Starting from Rs.4,999 only, the three unbeatable Jadoo Box packages are also available on easy installments. Moreover customers can make free On-Net calls from PTCL to PTCL and to Vfone, and can get an EVO Nitro USB device absolutely free with 1Mbps DSL. Uninterrupted Connectivity: Go online 24/7. Jadoo Box provides you uninterrupted internet connectivity as it comes with default DSL and an EVO as backup connection. Multiple User Compatibility: Multiple Users at home can access internet simultaneously through a single connection. Faster Speed: Enjoy a high speed internet connection that lets you experience streaming videos, online gaming, multimedia files at much faster pace; therefore, helping you save time Telephony, Integrate your IP telephony with value added features. Wi-Fi Access: Built-in Wi-Fi access – to provide wireless connectivity for multiple home users Auto Switchover. The last but not least is the auto switchover between your primary and backup connectivity. Commending the PTCL Jadoo Box brand team for their latest innovative accomplishment, Mr. Saeed said that it will be a new landmark in building PTCL’s unparalleled reliability for providing uninterrupted connectivity to all of its customers nation-wide.